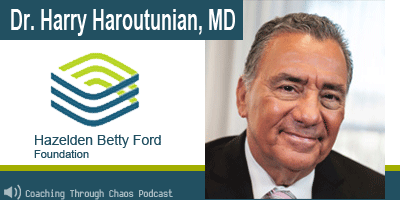 In this podcast, Dr.Mullen speaks with Dr.Harry Haroutunian, the Physician Director of The Betty Ford Center. They discuss some of the many services available to assist addicts in their process of recovery. The Betty Ford Center recently merged with the Hazelden Foundation and together they provide a wealth of services and programs to people suffering from addiction and their families. The article details the Children's Program and the Clinical Diagnostic Evaluation Program. Dr. Mullen reviews statistics on drug and alcohol use from SAMHSA (the Substance Abuse and Mental Health Services Administration) and NIDA (the National Institute on Drug Addiction). If you or someone you love is suffering from an addiction, resources are available. Help can be found online, in support groups, help lines or by reaching out to addiction treatment providers in your community. A short list of resources completes the article, to provide information and link to services. Please contact DrMullen@CoachingThroughChaos.com if you need help figuring out how to connect to resources in your community.